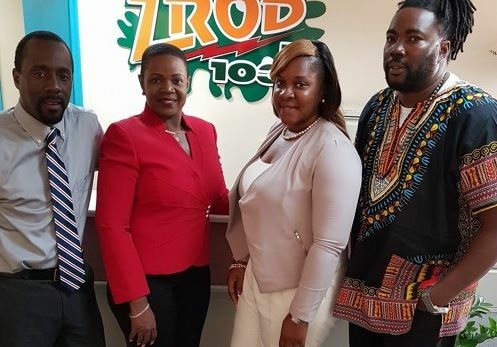 These were the firm words of Chairperson of the Virgin Islands Festival and Fairs Committee (VIF&FC) Kishma A. Baronville, while a guest on the Morning Ride Show aired on ZROD 103.7 FM on July 19, 2016. There have been reports in the media and in other quarters that the VIF&FC was struggling to get participation in activities this year, including the festival parade. Baronville, however, rejected those assertions. Host of the show, Mr Paul ‘Gadiethz’ Peart said some members of the Guyanese Association of the BVI had expressed some concerns to him about other nationalities' participation in Emancipation Festival being frowned upon. Persons have in the past expressed a concern that allowing more expats in the festival would not portrait a ‘true Virgin Islands’ Festival. Radio talk show host, Donald E. de Castro has been one of those persons to make such a comment. Baronville bluntly rejected that argument, saying such representation has never come from the VIF&FC but from voices within the community. The VIF&FC Chairperson added that the Virgin Islands should embrace the changes in the community. “We highlight our traditions and we respect the fact that our culture is diversified. It is something that changes but we need to put on a celebration that also reflects our traditions…Especially for the Caribbean nationals, we share the emancipation spirit and we want everyone in our community to participate. “I know that the festival committee is one that welcomes diversity. We do understand that we have a responsibility to highlight the Virgin Islands culture and we are about that but we do know that we cannot exclude persons and we want everyone to enjoy Emancipation Festival,” Baronville said. Virgin Islands Festival 2016 will be held from July 22 to August 6, 2016. The festival village, named after Rita Francis, will be opened on July 25, 2016. Only now they trying to tell us what os suppose to happen. NDP really mash up festival. Festival doesn't have money because the NDP broke the country. They have while everyone else is hurting even to Festival. He found a million dollars to do an unbudgeted school wall that lacks transparency; he camcelled high school graduation to put in a needed but unplanned extra year calling it 6th form; he spends one hundred thousand yearly on a speech writer & so on but he can't find the money to give to festival on time although it was budgeted for. Myron & NDP has killed the BVI. Myron cannot spend what he is not given. He doesn't have money to spend as he chooses. In modern politics, a speech writer is necessary? Barack has one. Trump has one, even though he or she messed up Melania. Get with the times. People are always ready to call down our own. Myron is not the Minister of Finance. When he gets, then he can expend. Myron and NDP has not killed the BVI. The BVI is alive and well, such that persons come each August and refuse to leave. God bless the land of my mother's birth. If Festival was a consultant, a high level NDP crony or family, or a multimillion dollar project it would have already gotten its money and got it on time. Lazy people. People who don't know how to work hard. People who don't have time for hard work will always fail. Create fun to raise funds. They doing nothing to help the government. Nothing to hype the thing. U need very little money to start a fun raiser if u know what u r doing. I won't blame the incompetent committee. Its the Minister that failing us. So Government putting more money into Festival will mean more troupes? What does the money have to do with people participating in Festival? Why would a VI parade have in other nationalities? Then it's not a VI parade... Ayo know you ain't got no participants trying to trump up excitement for a dead carnival and now trying to fill stops with others nationalities cause you all done drop the ball and no locals wants to join. Kishma should've stick to resigning, her credibility is shot dead. the fillipinoes were dissed when they made an entry years ago. The lack of interest in Festival is a sign of protest against this lying, thieving, bully, vindictive NDP gang to let them & the world know that we will not allow them to enslave us again. I heard 5. The Chairperson could have enlightened us. It's late already. People need to know. I personally don't do the troupe thing, but usually come out and watch. Last year I didn't leave home until 4:45pm and was still quite on time. Depending on how many troupes there are, I think I may just stay home and watch. Flying outta here....everyone who's around....enjoy!!! Dirty politics killed the BVI along with all the contests. Stop blaming politics, it's greed and nasty minded individuals that killed this country, not politicians. The politicians are just at the mercies of the same evil, who are also voters. No matter who are voted in, once these greedy leaches continue to wield their voting power the place will continue to go downhill speeding. He cancelled the graduation tell him to cancel the festival also . The government put money into the festival but let me say it takes a lot of time and money to get the costumes ready for the celebration. The government make money also what about departure , hotels and motels taxes and the business make money also. All these comments about who should and who shouldn't be allowed! Anyone ever been to Trinidad carnival? Yes the big one. People from ALL OVER WORLD come for that. Funny thing - all are welcomed too. People in costume from all nationalities taking to the streets together. Spending money and more money. But here it's us against them as usual. Broaden your horizons.